Review | Skoda distinguishes itself from other brands by being smarter and cheaper. The smartness can be found in little details that make everyday life with a Skoda more pleasant. The low price is thanks to the collaboration with Volkswagen, which gives proven technology a second life. This time Skoda doesn't introduce an "old Volkswagen" in a new suit, but rather a brand new one with Skoda looks. Still the price is lower. Too good to be true? Skoda, Seat and Volkswagen don't try to hide it: together the three brands developed one small city car. Each manufacturer then customises it to appeal to their specific audience. The Czech carmaker did so by giving this small car a sturdy look, enhanced by a stately, chrome grill. This makes a big limousine look important, while it gives the tiny Citigo a daring look. In this way the Skoda isn't a cute, girly car. Take special notice of the logo: the Citigo is the first Skoda to carry the new badge. The cabin has also been modified to give it a unique character. 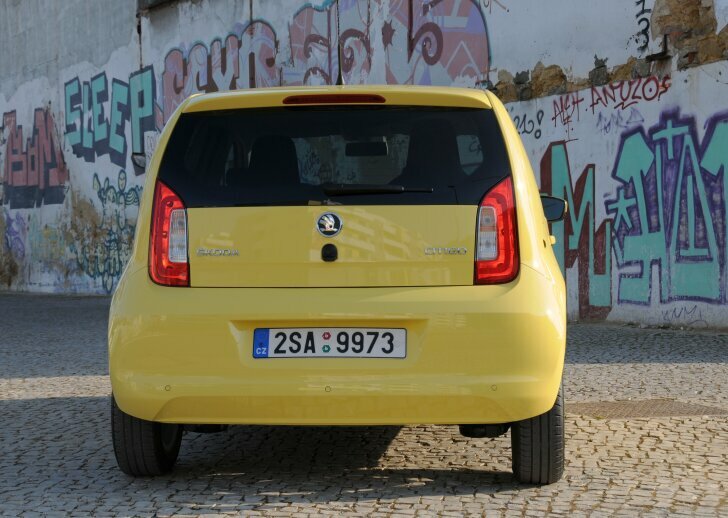 As stated before, Skoda tries to be cleverer than the rest and this is where the Citigo really shines. Wherever possible, Skoda fitted extra storage spaces, hooks, nets and other gadgets. These hardly make the car more expensive, but certainly do make it more pleasant to live with. Other examples are the nets on the side of the front seats (to hold bottles of water) and the iPhone cradle that fits in the centre console. A tiny plastic clamp on the windscreen makes it easy to display a parking ticket, while the same clamp on the dash can hold a photo of your loved ones. Just like the Volkswagen and Seat siblings, the Citigo does have a few shortcomings. The most significant of these is that the shelf doesn't move with the boot lid. Every time the lid is closed, the shelf blocks the view in the rear-view mirror. Also annoying is the low number of ventilation shafts on the dash. When the Citigo is fitted with power windows, the left window cannot be operated from the right. The five-door version driven here makes entry to the rear easier. Be aware that the rear windows can hardly be opened at all. The rear windows do not slide down, but instead just pivot to an opening of no more than 2 cm. Space in the front is fine. Legroom in the rear strongly depends on the posture of the driver and co-driver. It's become a trend for small cars: a tailor-made cradle makes a cheap, portable satnav unit integrate in the dashboard. Skoda worked together with Navigon to offer such a system, which easily fits in a special slot on top of the dash. After that all instructions from the satnav sound through the speakers of the car. Information from the trip computer is shown on the Navigon screen; that saved Skoda a pricey colour display. The optional "City Emergency Braking" deserves special notice. When the Citigo is driving at a speed of no more than 30 km/h (18 mph) and is about to hit an obstacle, the car brakes all by itself. In that way typical head to tail collisions in city traffic can be avoided. A test (with a plastic target) shows the system works perfectly well and certainly is worth the extra money. 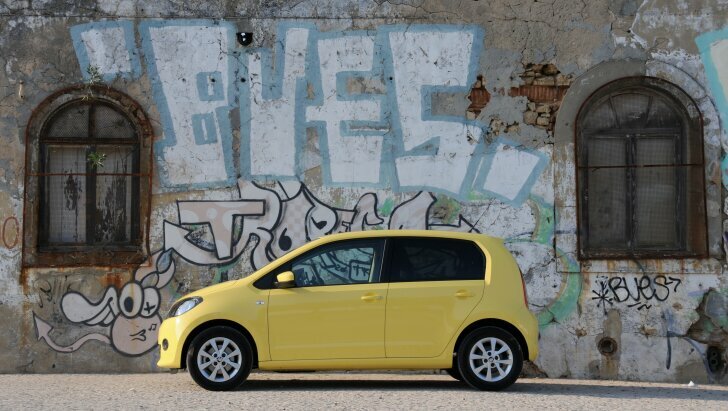 The Citigo comes with a 1.0 litre three-cylinder engine which develops either 60 or 75 PS. In both cases it is obvious that the engine has been tuned for fuel economy rather than performance. Yet, in city traffic the Citigo is eager and quick. On open roads the car has to be provoked to perform. It's only when the pedal is pressed to the metal that the Citigo accelerates quickly. Of course the 75 PS engine performs better, but the 60 PS already does the job well enough. Because this car seems to invite the driver to go slow, it is easy to drive economically. A long drive over motorways cost just 4.4 litres per 100 km (64 mpg). After an hour of city traffic this rose to 5.4 litres per 100 km (52 mpg). This is because the Citigo isn't fitted with a stop/start system, yet a city car can highly benefit from this. The Citigo feels at home in the city. That isn't just because of its modest size, but also thanks to the boxy shape which makes it easy to determine its size. The turning circle is small as well. 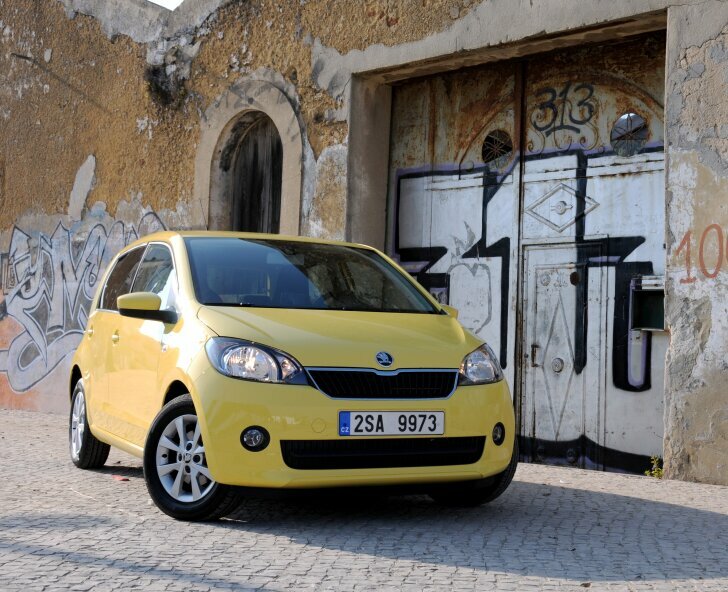 The Citigo has very firm suspension and can therefore be less comfortable on bad surfaces. It does mean handling (and safety!) is excellent. Even when cornering fast, the tyres don't even screech. On bad roads the car doesn't jump, so the tyres always stay safely in contact with the surface. This is also why the Citigo can cut through city traffic with exceptional ease, just like the name suggests. Is the Skoda Citigo too good to be true? Yes and no. No, because the Citigo doesn't drive any differently from its Seat and Volkswagen siblings. That means: the Citigo handles very well, is safe, offers sufficient comfort, performs fairly well and is as frugal as Skoda promises. 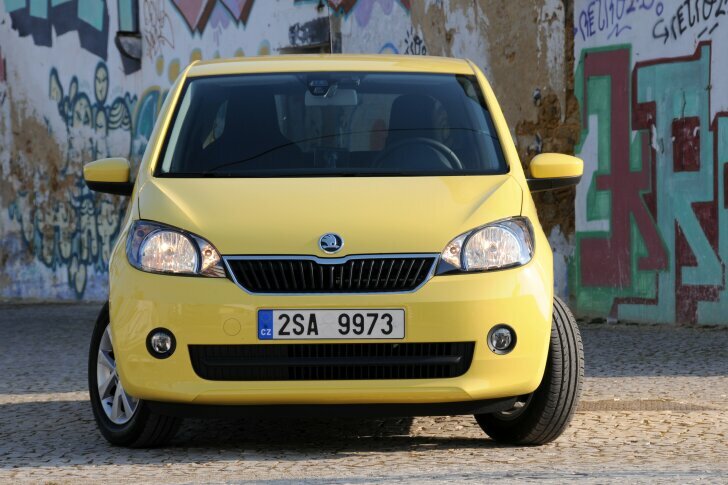 It also means the Citigo is among the best of the small cars at this moment. Although the price will be lower than that of the Volkswagen, residual value will also be lower. It's only on details that the Citigo is smarter than its counterparts. The design is more mature and the extra storage spaces make the Citigo even more practical. "Art on the square inch"